First of all, let us praise the Lord for imparting His wisdom to us throughout this congress. We also thank Him for it is because of His grace and blessings that we have completed this congress successfully. I believe all of you would agree that we have had an effective and fruitful meeting. Of course, this would not be possible without the hard work of the hosts. 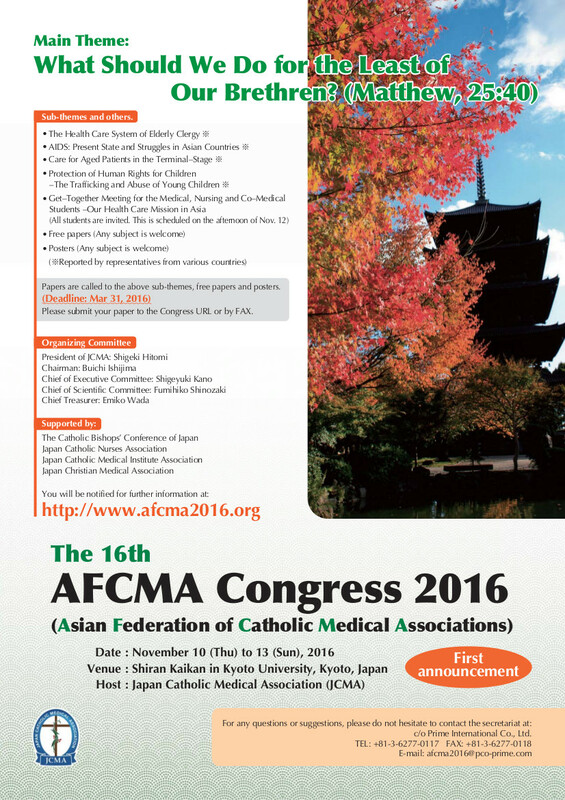 I would like to acknowledge and sincerely thank all the organizing committee and Japan Catholic Medical Association for hosting us in this Congress. Last but not least, I would like to sincerely express my greatest appreciation to all of you valuable AFCMA members and distinguished guests for putting your best effort in actively participating in this Congress. In the last few days, we have had collegial discussions covering a wide range of topics relevant to our present situations. We have shared ideas and voiced our opinions in how to better shape our organization for the future. In my opinion, we have achieved a lot in this Congress. I have deep confidence in all of you that together we can fulfil the commitments and achieve the goals we have set in this meeting. I also genuinely hope that each of us participants would return to our home country strengthened by the support we have found in each other during this Congress. I would like to thank all of you AFCMA members who have put your trust in me to lead you in the last four years. Once again I would like to offer my deepest apologies if I am not able to fully accommodate all your needs as individual members of this organisation. I sincerely hope that our new leader Dr. Manuel Po and his staff can learn from my experiences and put more effort in improving communications between AFCMA members. Before ending my speech, I would like to make an important announcement. The AFCMA Executive Committee has decided that the 16th AFCMA Congress will be held in Malaysia Hopefully all of us can meet again together in that beautiful city. Finally, I would like to offer my most sincere prayers to all of us here present and to our sisters and brothers who are not able to attend this meeting, may we all continue to be great proclaimers of the Gospel, who live our Catholic values not just through our words but also through our actions in saving people’s lives. God bless us all.